While people still argue and many are prepared to debate long into Sweden's success in managing its forest resources for bio-energy, other nations with good biomass resources can learn from Sweden's policies. Malaysia is still rich with forest resources and it doesn't do any harm at all to learn a thing or two from their success. Today, forest residue is the leading bio-energy source in Sweden, and compared to 3 years ago, bio-energy is now the nation’s biggest energy source. the Sweden's debate over nuclear power. Since late 1970s, Sweden has been seeking new and safe energy sources, evidenced with the initiation of national research into renewable energy. Heating plants had largely switched to biomass, which made up 70% of district heating fuel in 2010. Biofuels: Swedish cars use high-blend bio-fuels such as E85, which can contain up to 85% ethanol, and biogas, and at the end of 2011 Sweden had more than 200,000 flexi-fuel cars on its roads. Biomass: Biomass for heating accounts for more than 50% of all space heating in Sweden's housing and service sectors. 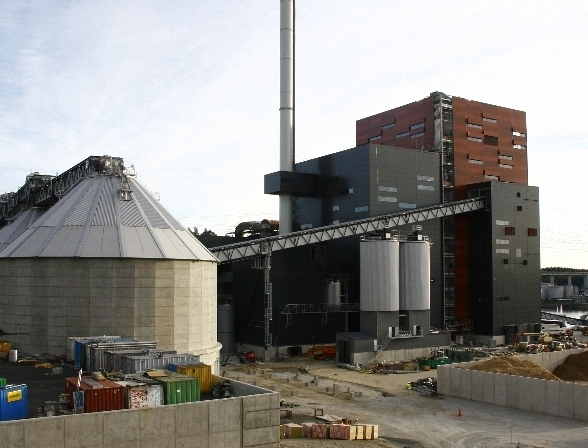 It is no wonder that there are around 100,000 small-scale pellet heating systems operating in Sweden. Note: The book that talks about the Swedish bio-energy success story (priced about $12.50) can be found at Svebio. TheGreenMechanics: Swedish car buyers receive a rebate of SEK10,000 (US$1560 or approximately RM4,850) for buying a green car. We don't have similar cash incentive in Malaysia. But we can surely learn from their environmentally-friendly policies. I wonder if our government is interested in this clean energy...doubt it..
As long as it doesn't pollute it is ok,we have a biomass plant in Bentong,Pahang which supply steam to a paper mill emitting lots of smoke.